The condition of this pen was a disappointment to me. There were a few tiny dents on the celluloid barrel (I’m not normally one to obsess about such things), BUT the biggest annoyance were the cap bands. There is a weird rippling on the cap bands, as if they’ve been held to a heat source, and they actually spin around completely. One of these days the thin metal is going to tear and the bands are going to fall off completely. Its extra annoying to me as I keep this pen in an Omas sleeve as it is very delicate, much more fragile than my other Omas pens, and so every time I take it in and out of the pouch the bands slightly snag, further hastening their demise. Here is a close up of the cap and the dreaded bands. I bough the pen from the USA from a prominent (and usually great) vendor. They offered a full refund if I sent the pen back, but as it was such a hassle to get the pen to me in the first place (UK Customs were a major pain and took over a month to release it to me, and only after I had to complete a long and useless form), that I couldn’t bear the thought of returning it. I had also paid a pretty penny for it, but as its quite a rare piece, I wasn’t going to find it any cheaper from a European vendor. So I decided to keep it. Thankfully the nib is a very nice and juicy two-tone 18ct gold Fine nib. It writes like your writing with golden pencil (you know what I mean, right? ), and has that lovely Omas feedback. I didn’t ask for any modifications as I know Omas nibs are usually great out the box. I’m glad I didn’t. The main draw of the Omas Extra Lucens for me was the barrel material- a semi- demonstrator celluloid with shards of gold & black throughout. 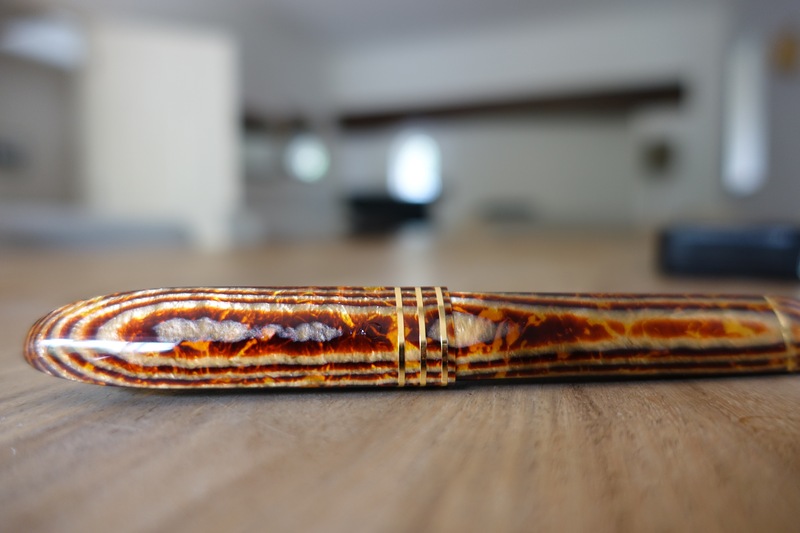 It is a real looker, and I haven’t seen this material on any other Omas pen, other than a Ogiva cigar, but that is super rare and VERY expensive to procure. The cap and piston knob are made from a black and gold celluloid, that can be found on the Omas Balogne. The contrast of the semi demonstrator barrel and the black cap and ends, make for a super classy-looking pen. The old style paragon model used for the Extra Lucens, with its nice proportions, and multi facets really allow the celluloid to shine (literally). The clip also looks perfect. So much nicer than the beefier new style Paragon. There is something very precious about this material on this particular paragon model. I love to have it filled with Kingdom Notes Chysaora Helvola (Jellyfish) ink. This well lubricating golden ink with sheen is a lovely glistening pairing for the swirling caramel Extra Lucens barrel. I wont part with this one, save for maybe getting the bands repaired or replaced at a future date. This is the last of the three Omas celluloid fountain pens I managed to grab in a frenzy towards the end of 2016. I had been labouring under a self-imposed fountain pen-buying ban since the Summer, when I had taken steps to reduce and consolidate my collection. that consolidation process resulted on a focus on Italian and Japanese fountain pens, but mainly Italian fountain pens, and mainly Omas fountain pens. The “Bologne” from Omas is a large fountain pen with a piston- filling mechanism like the other high- end models. However I believe it is less favoured among Omas collectors and the general fountain- pen buying public as within the range exit a number of cheaper resin fountain pens with a cartridge- converter filling mechanism, some of which are in rather garish colours. I know these models are popular with some enthusiasts, though they never really appealed to me. This Burkina celluloid model on the other hand, together with its Lucens counterpart, are very appealing. The Omas Burkina Bologne has a silver section, a nice balance and is surprisingly light weight without feeling cheap. 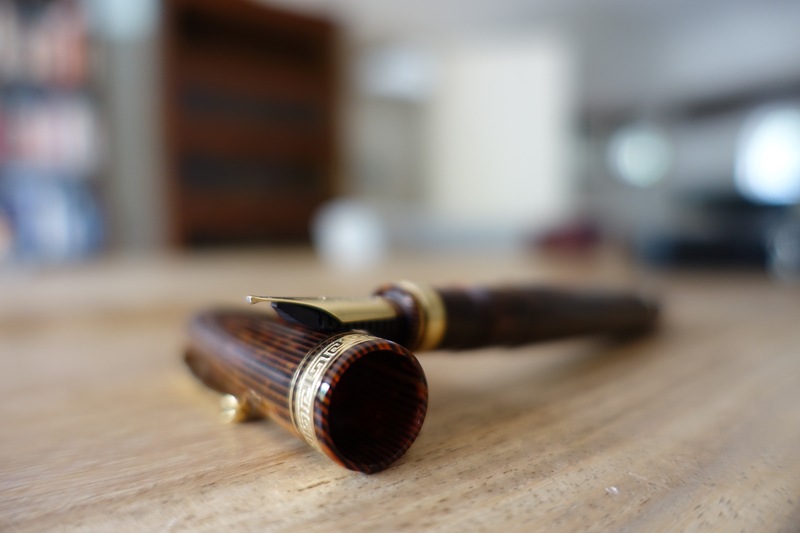 The Omas Burkina Bologne has a Medium nib. It’s just a Bock medium, but is smooth and wet and nice enough to write with straight out of the box. However, it doesn’t have that signature Omas feedback (pencil feel) that I get with my Omas Ogiva and Cinema. Here is a close-up. Like the Omas 360 Burkina model, the Bologne has a silver section. This is a problem for some as it means it can be cold to the touch in cold countries, and super slippery in hot countries. For England though, its not a problem. One small point I’d mention here is that I find the cap is quite a tight fit on the silver section. Celluloid material contracts and expends (usually contracts with time I believe), and so this non- contracting or expanding silver material was probably not a very wise choice. I also had a few issues with the piston turning out too much. I had this problem with one of new style Omas Paragons, and now it needs to be sent off for repaid. Sigh. Unlike the Milord and Balogne models, and the new style Paragon, it doesn’t have the Omas “O” logo on the finial. Being called “Burkina”, the celluloid’s obviously inspired by African design. I have seen this material being used on the Omas 360, Ogiva and old style Paragon. Burkina celluloid is a very vibrant yellow, with black checks darting in and out of the golden yellow celluloid. Very unique indeed. I like it. Like the Omas Princess below, I found this piece towards the end of the year in a frantic search for ever declining Omas stock on eBay. I got it at a great price too, so was a little apprehensive at first as to the condition of the pen. The Omas “the Cinema” pen arrived in a somewhat unobtrusive 80’s looking plastic box, but when I opened the lid…bam! As I was just saying…what a celluloid this is! I haven’t heard much talk about the Omas pearlised grey celluloid in general, let alone the Omas Cinema in particular, so really didn’t know what to expect here. I have a number of the arco celluloids that people rave so much about- like the arcos verde and bronze, but I have to say this pearlised grey celluloid is spectacular! I can only describe as crushed black velvet. But shinier, and more impressive! I should also mention the Cinema uses the old style faceted Paragon model. This is probably my favourite model in the Omas line as it looks so perfectly in proportion, the facets let the celluloid shimmeriness reveal itself, and its a very ergonmic size and weight for most people. The cap is very tasteful as well. Here is a close up of the celluloid. As you can see the words “Omas The Cinema 1895- 1995” is engraved on the barrel. Unusually for an Omas, the Cinema has a unique cap band, with little film cameras and film reels etched onto it, in lieu of the usual Omas greek key design. It sounds weird and blingy but doesn’t look tacky at all. 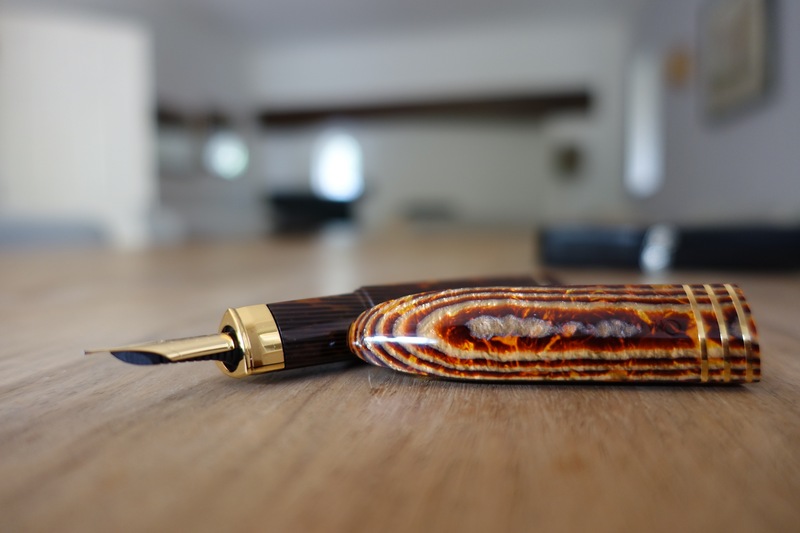 The gold is a bright and shiny contrast to the deep black/grey celluloid body of the pen. The 18ct gold nib on this Omas Cinema is Fine. However, it is no ordinary Fine. I believe this is not a Bock nib at all but one of the Omas nibs made in- house. It looks fantastic and is a real joy to write with. I don’t know how, but it just feels like I’m writing with a gold pencil. As with all Omas pens it has the obligatory ebonite feed. And here is the writing sample with same ink…. So sad Omas are out of business- but so glad I managed to grab this pen. I’d give the Omas “The Cinema” 5*…and an oscar too! I found this piece towards the end of the year in a frantic search for ever declining Omas stock. 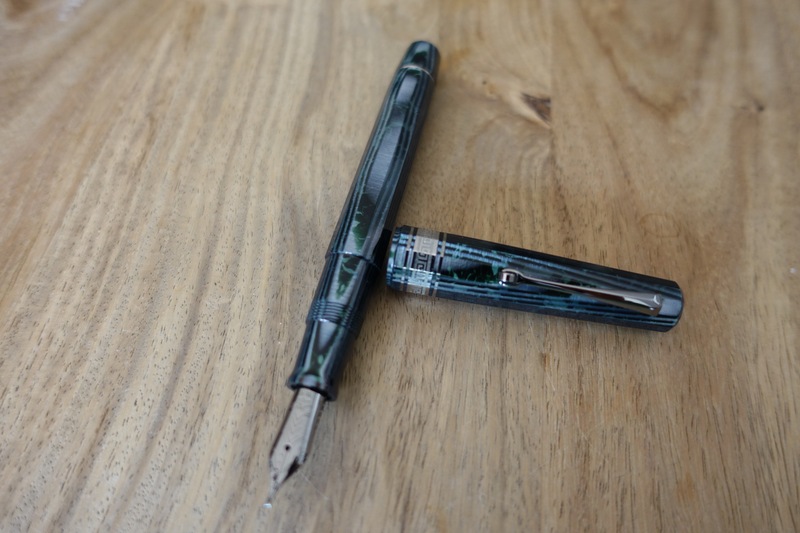 I hadn’t had the blue-royale celluloid on my radar at all, favouring the more obvious arco-bronze and arco-verde’s, but I found this Omas Princess at a decent price (well, decent given the stratospheric rise of Omas over the past 12 months since closing business!) on eBay. It has an old- school vintage look with a blue cotton tassle (tassie?) attached to the finial. 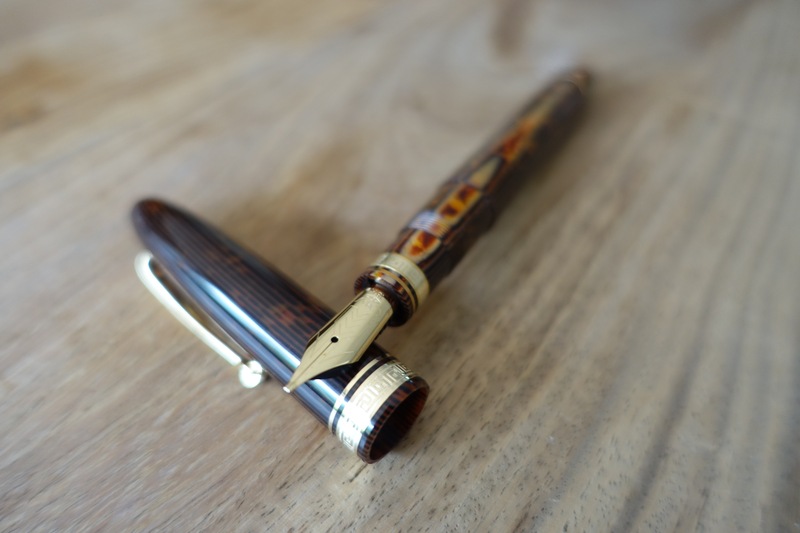 It is a very small light-weight fountain pen, with the typical piston- filling mechanism. It isn’t a design I would normally go for with more modern pens, but I have bought a few vintage pens with a similar look in the past. As for the celluloid, blue isn’t really my favourite colour, except for the Ao-tamenuri of Nakaya, but due to aging(!) exposure to light (oxidation? I was never good at science…) it has turned a kind of purpley- blue. This Fine 18ct gold nib is smoooooth! Has a nice 8/10 ink flow and is just a joy to write with. I think was one of the in- house Omas made before they started using Bock nibs. It’s a lot smaller than the nib on my Paragon, but still, wonderful to write with. A great little pen for the price, adds a nice variety to my Omas celluloid collection. Last attempt…I think this is the most accurate representation of the blue-royale celluloid. I finally added an Omas Paragon (new style) to my collection. Here are some pics. Suffice to say it was well worth the buy. I scoured the internet looking for this pen soon after hearing of the sad demise of Omas. Alas they were sold out everywhere. Everywhere that is, except Amazon of all places! So I picked one up in a Medium nib, naturally- this is Amazon after all. This is how the Paragon Arco celluloid arrived to me all the way from Amazon. Lovely presentation as always. As you can see the new style Paragon model is VERY substantial. Unlike the substantially smaller old style Paragon, there is a giant “O” for Omas on the finial- I actually really like this. Plus on side view you will always know which pens are in your pouch. The cap is also a departure from the old style Paragon, and is much thicker and longer rectangular shape, with the same wheel at the end, only this time much bigger. This Omas Arco Paragon was one of the last models Omas made before it shuttered. As such I’m pretty sure the Medium nib is a standard Bock one. As such it is a bit Blah. It doesn’t have the springiness/ softness of the made- in-house Broad Arco Ogiva I have, or the old style- Arvo- Verde Paragon, but it is still a smooth writer with zero issues straight out the box. Right now I don’t have that many Medium nibs that haven’t been customised in some way to oblique/ stub/ cursive italic/ flex etc. etc., so I guess it has its place in that sense. However, I would like it customised in future, maybe even a fat stubby re-tip of some kind. What I’d really like to do is swap this nib with the BB stub nib I have on my Omas Paragon Resin. The piston has recently broke on that one, so I’d love to swap it into here. Will have to look into where to send this off for such a procedure. This one I bought second hand and pre-ground with a super smooth and awesome BB nib. I went through a bit of a Omas obsession in 2015. 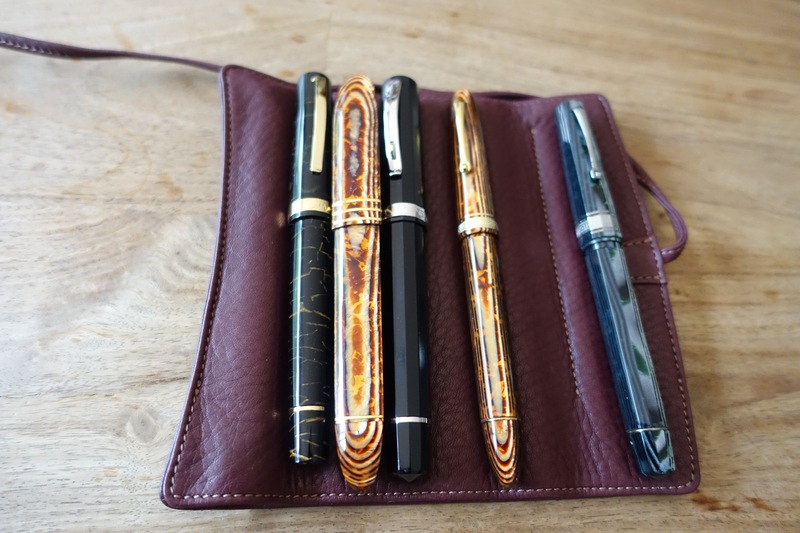 Here are some of my Omas fountain pens, resting on my Nagasawa leather pen pouch. (Please see the Accessories page for more information on Nagasawa kip leather products). The Arco- brown celluloid is often cited as the best celluloid material anywhere. Fortunately so far I have two Omas fountain pens in this finish. I would love to add a third with the newer, heftier Omas Paragon…if only I had the budget. To me they give the sensation of writing with pure gold. I have used 21ct gold Sailor nibs, and to me they resemble gold far less than the 18ct gold you generally find in Omas. They also have a lot of tipping and are the best nibs for customisation. But even without customisation, Omas nibs are awesome. Showing off the “Broad” nib. It’s more like a Double Broad, or even a Stub. The nib was something of a disappointment. I ordered it in Fine. It arrived dry as a bone and simply wouldn’t write at all. There was either some kind of misalignment with the nib and feed, or it was some issue with the nib itself. Something worse than baby’s bottom. Either way having no Omas tools or any idea how to use them, I decided to send the pen off for fixing at an overseas nibmeister. I decided on converting the Fine nib into a crispy cursive italic/ stub. When the pen arrived back to me it wrote like a dream. It simply glided across the page on all different kinds of papers. It was (is) one of my favourite nibs ever. I love to have it filled with brown inks, especially Maruzen Athena Sepia. Unfortunately, my dear Omas 360 soon started leaking at the section where the gold collar meets the celluloid. Added to that, I managed to accidentally drop it down two flights of stairs from the attic (so technically 3 flights of stairs including the attic ladder). Don’t ask me how or what I was doing with my Omas 360 in the attic, I honestly couldn’t tell you. All I can promise is that I didn’t drop it on purpose. And I almost had a heart attack when I did. This added to the drama of my precious fountain pen by dislodging the gold plated collar from the section. In a way this was fortunate as I then discovered that without the collar the pen wasn’t leaking at all. There was no crack. It seems instead that the ink is getting on the collar from the juicy ebonite feed, and this was somehow creating a mess with my fingers when writing. I tried adjusting my grip to further back on the barrel, which I naturally do with some pens (the Omas Cinema for example, and Danitrio Genkai, I have no idea why), but something about the shape of the 360 had me gripping close to the nib after a few minutes and creating another mess. I know its not ideal, but as there is no actual collar to snap the pen closed securely, I now use my Omas 360 as a desk pen. The pen fills like a normal piston filler, so I just fill it up, knowing it won’t leak, and gently cap the pen without the collar. Thankfully, as the pen has such a decent flow (I requested 9/10), it literally never dries out despite not having the extra seal of the collar. It’s not an ideal situation, but it works for me. Despite the drama, still one of my favourite fountain pens. The Arco- Verde (green) celluloid is probably my favourite celluloid that Omas produce. It features on one of my favourite fountain pens; the Omas Old style Paragon with ruthenium trim. I love the shimmering cool, stony colours of this pen, and it works perfectly with the stealthy ruthenium trim. I actually prefer greens and greys to reds and browns (same for Nakaya, I much prefer the Ao- tamenuri and Midori finishes to the more popular Aka- tamenuri “reddish red”). I received this pen with a standard Medium nib that was a bit iffy out the box. There was a weird scratching on one side only. Not wanting to let such a beautiful pen be stuck with such an ugly nib, I bit the bullet and sent it off to a nibmeister. After a not very long wait, the pen arrived safely back in the UK. Phew. I had decided to go for a Medium Oblique Stub customisation, but a bit thinner on the cross stroke, so a Hybrid Cursive italic/stub Oblique. Thankfully the icky scratching has been completely banished and the nib simply glides accross the page. I do slightly rotate my pens (though often without realising it), so I find no snagging at all thanks to the oblique cut. Also, with obliques you can rotate the nib at different angles to add a little something to your handwriting. This pen is perfect filled with Pilot Iroshizuku’s Fyu-syogun, with the medium oblique (OM) cursive italic nib showing off the excellent shading properties of this ink. I say this about all my Omas pens, but this really is one of my top 3 fountain pens in my collection. This came with the Extra- Flessible nib.